Execution profiling tools like the SEGGER SystemView are using it to measure the time used for code execution. This post is about how to use it directly from the application code or to enable cycle counting and inspect it during debugging. To use the cycle counting feature, the DWT has to be configured and enabled. If you are connecting to the target with a debugger, then this is usually already enabled by the debugger. To make it work with no debug session active, I have to initialize it in the code first. 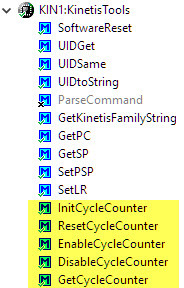 If your ARM Cortex-M has a DWT, you can use the cycle counter to measure the cycles spent executing code. That could be used for delay loops or to measure execution time. This entry was posted in ARM, Cortex, CPU's, Debugging, Embedded, Embedded Components, Freescale, LPC, LPC, Processor Expert and tagged ARM, Cortex-M, Counter, Cycles, Debugging, DWT, Embedded Component, Freescale, NXP, Processor Expert, software, technology, Tips&Tricks by Erich Styger. Bookmark the permalink. I just used your delay component code in a baremetal a while ago, I was wondering how you came up with the timings… Now this is neat! Good job! Thanks :-). Only keep in mind that this does not exist on the ARMv6 (e.g. Cortex-M0). Just what I was looking for! Well, I think. I need a high speed time stamp mechanism (+/-50uS roughly or better) to measure several event times in an application and I found your discussion here from a Google search (I read your stuff almost daily). I am trying to determine timing relationships between an incoming GPIO signal (which generates an interrupt) compared to inbound/outbound serial data. I wrote a logging function to log this information which I can dump and inspect. via a command line interface. I need to implement this across four K64F targets. My question is how do I compute the time from the DWT_CYCCNT? I am guessing this is running at CPU speed but is it incrementing every clock tick or every machine cycle? If machine cycle, then how to translate to time? My target is a Kinetis K64F Cortex-M4. yes, the DWT_CYCCNT runs at the core/system clock speed (SystemCoreClock in CMSIS-Core terms). It is good as a time stamp to measure code execution time in an accurate way. But that time will affected by the overhead to read the DWT_CYCCNT register and what the compiler or pipelines/caches are doing, so might not be always the same depending on pipeline/cache. There is a good article about this here: http://www.carminenoviello.com/2015/09/04/precisely-measure-microseconds-stm32/. But +/- 50us should be really doable. Other than that, if you have a high speed timer available, you can but you need to run that timer say with a 5us clocking (without interrupts, of course! ), then read that timer counter register for your measurement. Thanks for the tutorial, this was very helpful. hello,the register on DWT is too small ie the CPICNT only 8bits, how could i get the overflow event without effect the counting result? Thanks! The cycle counter is 32bit, I’m not aware of an overflow event. Thanks for your post – very helpful. However, I am attempting to measure the number of cycles for a piece of code which exceeds 2^32 CPU clock cycles in time, for an ARM Cortex M7 processor. Therefore there is an overflow issue and the counter gives me the wrong value. How would I go about changing the code above, to allow the counter to count above 2^32 CPU clock cycles? I have tried changing the ‘cycles’ variable type to ‘uint64_t’ however it does not solve the issue. changing the variable to larger type does not help. This will add some overhead, but at least allows you to count it >32bits. Another approach would be to configure a hardware watchpoint trigger to trigger when the counter is about to overflow. Thanks for the guide. Hovewer i got one question about cycle couting. Let’s say i got 48MHz system clock and my function took 2000 cycles so that means that micrcontroller needed around 41,6us to execute it?